My earliest memories of seeing coffee made at home was at my grandparent's house when I was just a little girl. My own Mom and Dad did not drink coffee or tea as a part of their daily routine, but at my Nana's and Papa's house, coffee was very much part of the morning ritual. Preparations were always made the night before, just after the dinner clean up was complete. 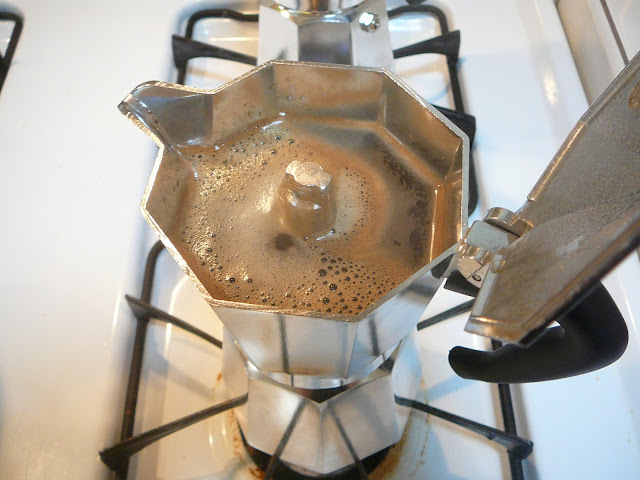 The 1960's vintage Faberware electric percolator was filled with water by Nana, and then the little metal basket was filled with ground Folgers coffee from a can. The coffee basket was topped with the metal lid and inserted into the pot. Finally, the shiny lid of the percolator with glass knob on top was snapped into place. The next morning the first grandparent into the kitchen (usually Papa) would plug in the pot, and it wasn't long before coffee was visibly bubbling into that glass knob on top, and the kitchen was filled with the heavenly aroma of coffee brewing. Just smelling the brewing coffee while I munched on my morning treat (another perk of staying at Nana's and Papa's) made my morning complete. Then, snuggled up with my grandparents, who often drank their morning coffee in bed, their hair still tousled, we welcomed the new day together with their steaming cups of coffee on the night stands beside the bed. How could life get any better? As an adult I didn't really start drinking coffee as a regular part of my daily routine until the early 1980's. Since then I have managed to explore the gamut of coffees and coffee-making equipment. In truth, I have spent a small fortune purchasing all of my coffee accoutrements over the years in the quest to make great coffee and espresso at home. The assemblage of coffee making paraphernalia in the photo represents just my purchases over the past six years. My past is littered with coffee makers of all kinds, which eventually broke or were discarded for the hottest new thing. In about 1982 my then husband Danny and I purchased a fancy Toshiba automatic drip coffee maker that would grind the coffee and then brew it immediately. It was also programmable, but I found that this feature was not great for a household with small children and a mother who desperately needed sleep. Having a coffee grinder go off at 5:00am was jarring to say the least. 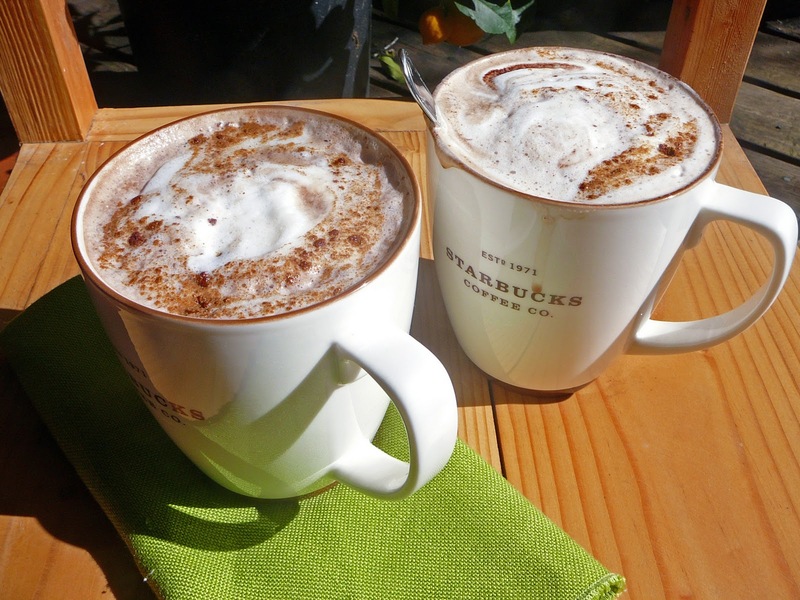 We also experimented with buying gourmet coffee beans for the first time. This was the advent (in California anyway) when small shops started opening that would sell good quality beans from all over the world. I continued to experiment with various coffee makers of all kinds up until 2004, when I bought my first real espresso maker, a Saeco that was made in Italy. It made really good espresso. Later, I bought a fancier model, a Breville that foams milk a whole lot better, but in truth didn't make any better espresso than the Saeco. Later, I experimented with using a French Press for making coffee, which is definitely the way to go for brewing coffee at home. A simple French Press out performs any electric coffee maker that I have ever used...and there have been many. The flavor of French Press coffee is terrific, and the coffee is served really hot - a must in my book, and cannot be achieved with an automatic drip machine. My espresso drink of choice over the years has become a mocha piled high with milk foam instead of whipped cream. And, in the last two years I have scrapped the more complicated production method required in using my espresso machine in favor of using a stove top Bialetti espresso maker for preparing the espresso, and a sauce pan and immersion blender to foam the milk. There is a small sacrifice of flavor. The espresso produced by the Bialetti is not as rich and pronounced as made by an espresso machine, but the ease and quickness in making, as well requiring much less clean up, makes it a winner for me. I remember my friend Richard singing the praises of this simple espresso maker from his days of living in Paris, as well as it being the choice to bring along on backpacking trips, but it took me twenty years to try it, and turns out, he was right. It makes a quality portion of what I would call a cross between coffee and espresso, just perfect for coffee drinks, or a nice strong cup of coffee. 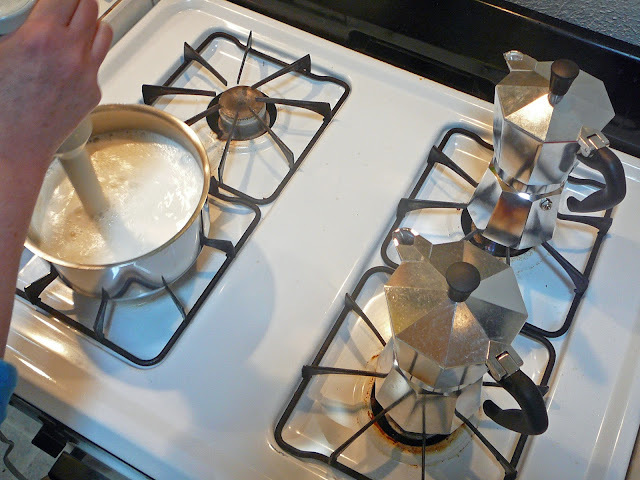 If you like to drink your shots of espresso neat, then the stove top Bialetti is not the technique for you, but if you enjoy starting your morning with a latte or mocha, you can have a delicious drink at home in a jiff. Oh, and a thanks to my Food Network "boyfriend", Tyler Florence who featured this method on one of his "Ultimate Breakfast" shows. This method is a much easier way to fix coffee drinks for more than one. 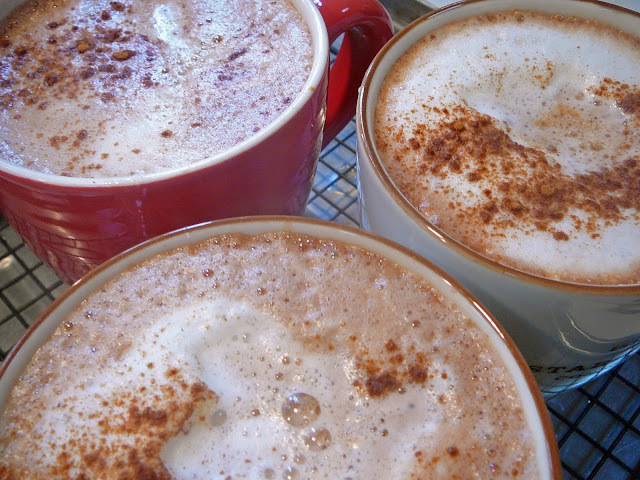 You can foam all of the milk at once, as well as brew a larger quantity of espresso, and the drinks are ready at the same time, instead of having to make them one by one. Don't have time to enjoy coffee at home most mornings? I don't know about you, but shelling out $5 for my coffee drink at a Peet's or Starbucks and having to stop on my way to work is not only inconvenient, but really expensive as well. It just isn't in my monthly budget, so I have found a great solution. Bodum makes a nifty French Press Travel Mug in which I can brew my coffee, add chocolate and a splash of half and half, depress the plunger, and I am good to go. One last observation. I have found grinding my own coffee to be time consuming and very messy. After purchasing an expensive burr grinder because my other Food Network crush, Alton Brown insisted it was necessary to have great coffee at home, I found it took up too much space on my kitchen counter, and I found myself greatly irritated after I used it. As careful as I tried to be, I found that I had ground coffee all over my counter and kitchen floor every single time. In addition, honestly, I was never able to discern that great of a difference in the taste of the coffee or espresso. For this reason I buy Peet's or Illy's ground coffee. It saves me time, mess and frustration. I am partial to French or Italian roast. I use the Illy canisters to store the ground coffee of any brand because they are air-tight, and compact. As for me, I switched to decaf coffee quite some time ago. Caffeine is a stimulant, which should be used with caution and with reverence. Caffeine increases cortisol (the stress hormone) in the body, and I don't know about you, but I have enough stress without taxing my body with more. So I made the switch to decaf, and I can say with certainty that don't miss the heart palpitations, jittery hands, or afternoon headaches one bit. 1. Fill the bottom carafe of the Bialetti espresso maker with filtered water to the line indicated inside the carafe. 2. Place the metal coffee filter on top of the carafe filled with water. Add coffee, roughly 2 tablespoons, leaving space for expansion. 3. Screw the lid onto the carafe base. Place on burner and turn flame to medium. abundant amount of foam. Turn off heat. 5. When you do not hear coffee percolating out of the spout into the holding chamber of the espresso pot, the espresso is ready. The top will be full. 6. Add chocolate mix to the bottom of your cup. I prefer Traditional Hot Cocoa Mix by Lake Champlain, but Ghiradelli makes a mocha mix that is very good, also. 7. Pour the hot espresso into the mug. 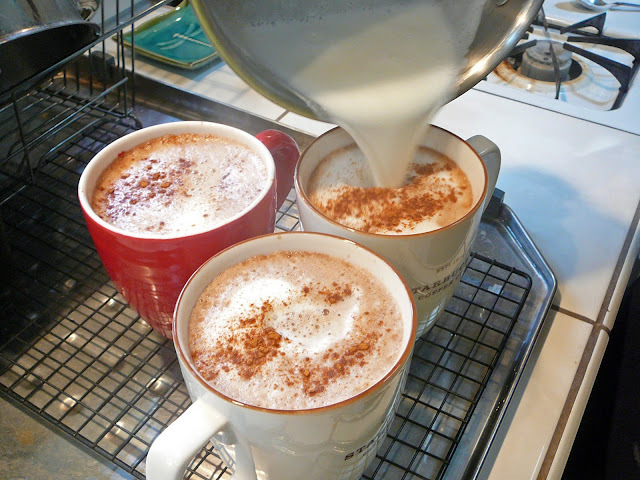 Stir well, I add a couple squeezes of Agave nectar and then I pour in the hot milk, topping with a huge mound of the milk foam that I sprinkle liberally with cinnamon. Can you talk a little about why to use a sauce pan instead of a microwave to heat the milk? I agree with you about the simple espresso maker. I used one when I returned from an exchange program in Italy, and find that I return to it after each visit back to the country. However, I veer away from it after several months, but can't say why. Perhaps it's the jittery hands and heart palps that get to me after awhile. On my most recent return to this maker, I have enjoyed the ease of clean-up! The coffee grounds stay clumped together such that a quick knock in the compost bin and simple rinse is all it takes. I also know what you're saying about the cost! Four or five bucks vs. fifty cents-ish...think of the ski passes I could buy! I love the salvation sisters! I feel the same way about grinding and finally went to pre-ground. I think it was just the ritual of doing everything from scratch. I even tried toasting beans once with a popcorn popper. Enough of that! I feel sorry for my parents who never experienced really GOOD coffee..every morning in the perc..Maxwell or Folgers. Ugh. Hi Dee! About 10 years ago I was doing some research for my job at the time, and I had the opportunity to chat with a PhD who was a pharmacognosist. He had done his doctoral dissertation on the effects of microwaves on plant material and the food we eat. He advised me to ditch my microwave because of the ill effects not only on what we eat, but potentially harmful effects on our bodies as well. I did as he suggested that very day, and haven't owned one since. Hence...my use of the stainless steel saucepan. In addition, you can keep heat on the pan and still use the immersion blender. Morning, Zoe! I just wanted to let you know that I had a good laugh from reading how you once tried to toast coffee beans in a popcorn popper. Now that's some creative problem solving! Hey Michelle, that was no laughing matter! A coffee roasting guy actually told us about that and it works...it just messes the hell out of your popcorn popper but that was all right. I much prefer the old grab a potholder and shake the bejezuz out of a lidded saucepan with kernals a' rattlin'. Linda, hardly anyone knows about the ill effects of microwave cooking. My husband and I researched it a long time ago and it has been known for some time. Think it was Swedish research. To think, there are some people who have never had ANYthing other than what comes out of a microwave. Yup, I admit..we have one..to reheat an already cooked lasagna,or something of that nature..but to cook from scratch??? Goddess help me!